What Everybody Ought To Know About Growing A Grant Writing Business! Just like there are certain things you should know before you drive a car...well there are certain things you should know before you attempt to develop a successful grant writing business. But, where do you go to get this information? Your local colleges and universities aren't going to teach you how to specifically grow a grant writing business. Most are only offering a half-way decent grant writing class which are sometimes taught by novice. Other affinity groups and professional development organizations are only focused on the fine art of writing better grant proposal. Well, that's not going to help you grow your business much...especially if no one knows of your existence. Sadly, most grant writing business owners have been left to figure out how to grow their business ALL on their own. This can be quite frustrating, costly and a real headache...especially if you are depending on it to put food on the table and keep a roof over your head. 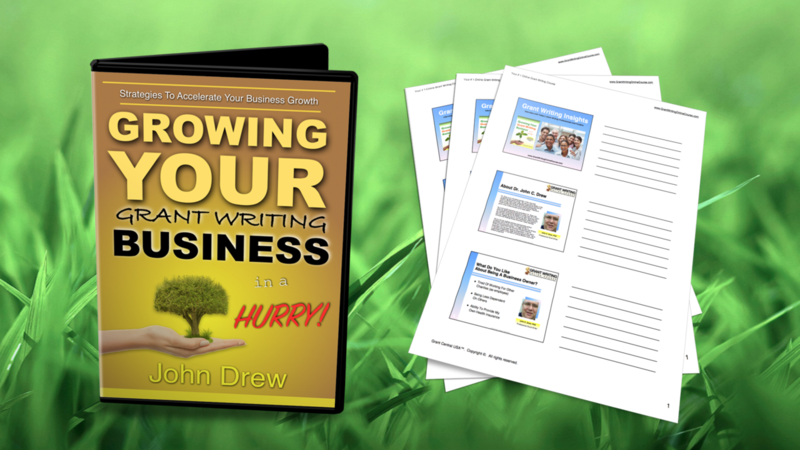 The Growing Your Grant Writing Business In A Hurry with John Drew helps you to start moving in the right direction and removes the mysterious cloud of mystery about what you should be doing right now to help your business succeed! Think about it. If you are going to do grant writing for others they are expecting you to at least know how to sell yourself...right? This insight is ideal for New and Veteran Grant Writers who are seriously seeking to grow their business...all spectators can please head to the stands. AVOID the time-wasting mistakes you are probably making by always driving out to meet with prospective clients (the money you'll save alone in gas with this insight makes this an invest you should jump on right this minute). You'll really appreciate when you discover the #1 Anxiety Remover that helps to calm your prospective clients fears when they are considering buying your services and how to works this again and again to your advantage! Find out the one thing that John was underestimating (and that you are most likely underestimating) that can have a profound impact on you getting more "Yes" and less "No's"... this can be a real game changer for you. Learn the Best Ways to move forward when you don’t have a strategy and are starting at ground zero. Get winning Advice on Pricing Your Services for maximum profit to start making more immediately!! Dr. Drew shares the secrets of how his grant writing business made over $30,000 in a single month and what he did differently to get these results! Think about it. Where else are you going to access this type of specific and closely guarded money making insight from in this industry? Sit with any half-way decent business coach who knows what they are talking about and you will soon discover that it will cost you at least $250.00 - $500.00. You'll get the same type of valuable counsel in this webinar without leaving the house. Discover one thing you have to develop the GUTS to ask for to get more business coming your way! Learn a counterintuitive move you should use now in your business that can have a profound impact on your bottom line. This exclusive and inspiring interview will shed light on an essential business tool that every grant writing business should have but most don't have! You will even hear the one thing that John credits as taking him from being an unemployable guy to becoming a successful business owner. There are so many valuable nuggets packed throughout each minute of the interview that can help you that you will find yourself listening again and again to take the actionable steps to success. WARNING: You will also discover that you are most likely making the same BIG MISTAKE that countless other grant writing businesses are making...Undercharging!! Don't let this "BIG NO, NO" keep you in prison from paying your bills and feeling used, underappreciated and upset! Learn how you are harming yourself by underpricing your services and what you need to do right now to reverse this disease! Don't drag your feet on this one...Regular price $79.00, but now just $69...order now! 37 minutes of great video content designed to help you grow your grant writing business! Enjoy a downloadable handout of this interview containing the important bullet points. A FREE Transcription of the interview revealing best kept secrets. And much, much more! !